Because of our achievement in the concrete industry, we as Houck Asphalt Maintenance can comfortably say we are the leader when it comes to asphalt maintenance and concrete repair. Houck Asphalt Maintenance provides asphalt and concrete solutions such crack repair, concrete repair, asphalt patching, seal coating and paving. No matter how big or small your concrete repair is, we always do it right, and that is why we take great pride in all the services we have provided to our customers. The products our company Houck Asphalt Maintenance uses are leading products in the industry and that is another reason why our concrete repair projects always turn out better than the customer could ever imagine. We at Houck have created a very friendly work environment to our customers, making them free to ask any question to our support team. We Houck Asphalt Maintenance handle any concrete repair, asphalt repair, or patch job. This job involves removing and replacing of the problem areas for concrete repairs or asphalt repairs. To ensure there is proper application we usually give infrared patching for the asphalt repair projects. When a customer contacts us to do their asphalt or concrete repair projects we at Houck will only provide quality and professional asphalt and concrete repair and nothing less. Asphalt and concrete base is usually destroyed by moisture and that is why we use the proper steps to help avoid cracks which allow water to get into the base. There is no concrete repair company that can compare to us at Houck. 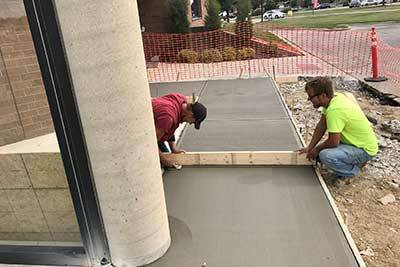 Just like any concrete repair job we take our time in the project from start to finish. Our concrete repair services are extended to both commercial and residential properties and for instance we provide concrete repair services to businesses or homes that have driveways, sidewalks, patios, curbs, or any other concrete flatwork that needs to be repaired. Our pricing at Houck is always fair and competitive and our belief is that a job should be done right the first time and that is another reason why we always leave our customers satisfied with our services. Over time your concrete driveway may start developing various problems because of foundation settling which means concrete repair will become necessary. When you start seeing the problems arise in your driveway, sidewalk, patio, or any other area you as the customer need to call us at Houck Asphalt Maintenance right away so we can get to the site and provide you with a free consultation. Through our concrete repair services, we are able to prolong the life of your driveway, saving you the need for a full replacement. With time every concrete surface will wear out as a result of weather and environmental issues, and the only solution is concrete repair. 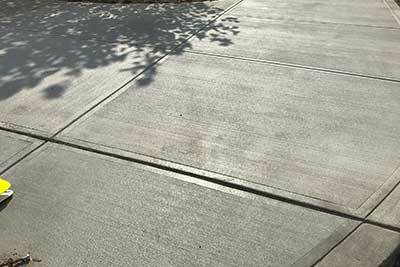 Driveways, sidewalks, patios, and all other concrete surfaces will begin to crack at some point. 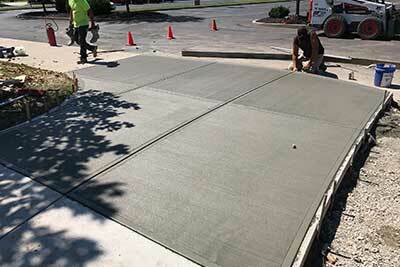 We at Houck Asphalt Maintenance take every precaution to avoid concrete cracking. When the concrete starts to crack you as the customer need to contact us right away so we can take care of the problem before it gets worse. Call us today for a free concrete repair quote.